Seriously, it’s true. ’twas the headline of the venerable Times of India, so it must be true. It is seriously brass monkey weather, especially in our totally unheated homes. Our house, heading toward it’s 40th birthday (I think) is full of doors and windows that have warped over 40 monsoons, no longer meet properly, and so there are draughts buffeting us from every direction. I am in 3 fleece mode these days, and trying to type with gloves on. That kind of cold. It was when I found myself huddled up like a granny (no disrespect intended to all my granny/grand-mere/gogo friends out there) in 3 fleeces + dressing gown + hot water bottle that I realised that the situation is desperate…bring on the Delhi summer, say I. And yes, feel free to remind me of this when we are wilting in 48C in 5 months. And so it was with some trepidation that I headed out to meet up with my running group for a 7am run this morning. Since I am “vela” (Hindi for jobless, basically) I have taken to running in the middle of the day, when the sun sometimes manages to pierce through the fog (oh, did I mention that it is foggy too?) but because I run with lots of non-vela folks, 7 am it was. They all have day jobs, in other words. 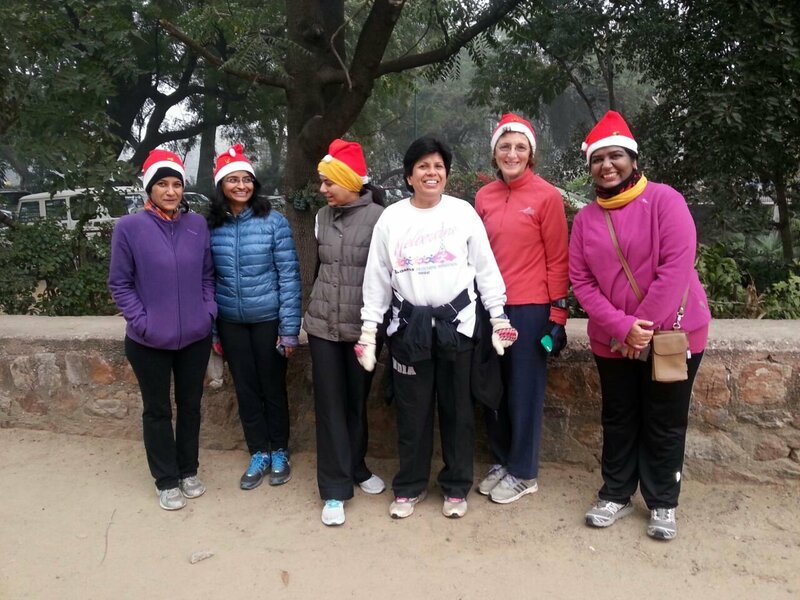 Getting up in the freezing dark, driving through empty dark streets, shivering our way around the Lodhi Gardens – arre, what a cold run it was. Brought tears to my eyes. We all wore Santa caps, but didn’t elicit many smiles from the decidedly grumpy crowd plodding round the gardens. We proffered a few “Merry Christmas” greetings, but not much reaction. I guess everyone was just way too cold. 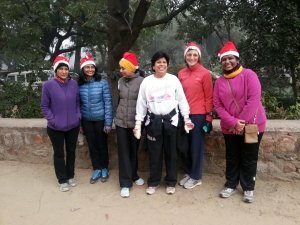 The only amazingly happy and smiling face came from a super cheerful lady to whom Doc introduced us – Sunita Godara – and what a brilliant encounter that was. I didn’t know anything about Ms Godara, I must admit, but I do now. I do so love such serendipitous encounters. If we hadn’t hung around debating where to go for a post-run breakfast, we might never have met this delightful, enthusiastic lady. Talk about a running legend. Well spotted! I did, indeed, live in SA for 6 wonderful years and have many gogo friends!